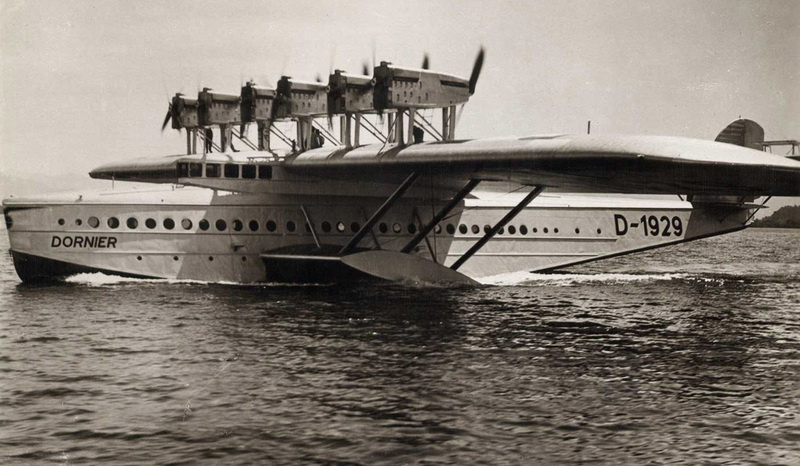 The Dornier Do X was a gigantic leviathan designed by Dr. Claudius Dornier in the 1920s. The initial plans were drawn up in 1924, and after a colossal 240,000 man-hours of work, the aircraft was ready for its first flight in 1929. 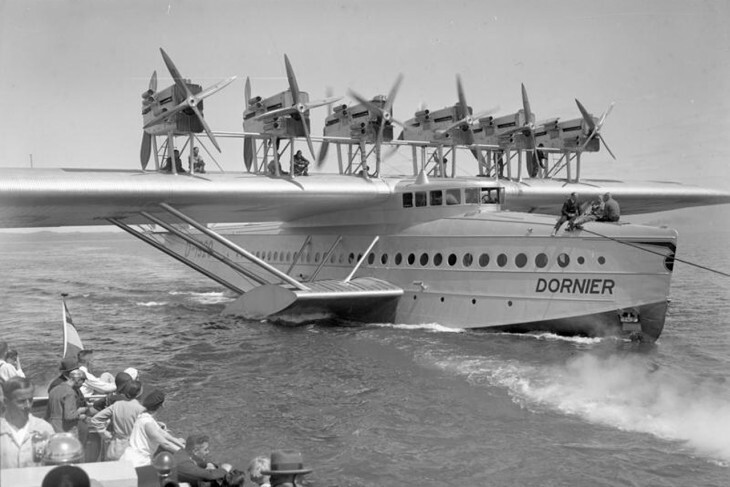 When it was finished, the Dornier Do X was the largest and heaviest flying boat in the world. It was powered by 12 engines - 6 tractor engines and 6 pusher engines. Initially it was fitted with 524-horsepower Bristol Jupiter radial engines, however these left the aircraft underpowered. In 1930, and after 103 flights, the Dornier Do X was refitted with more powerful Curtiss Conqueror inline 12 cylinder engines, each producing 610 horsepower. With these new engines the aircraft was able to achieve the minimum 500 metre (1,650 feet) altitude needed to make a transatlantic crossing. 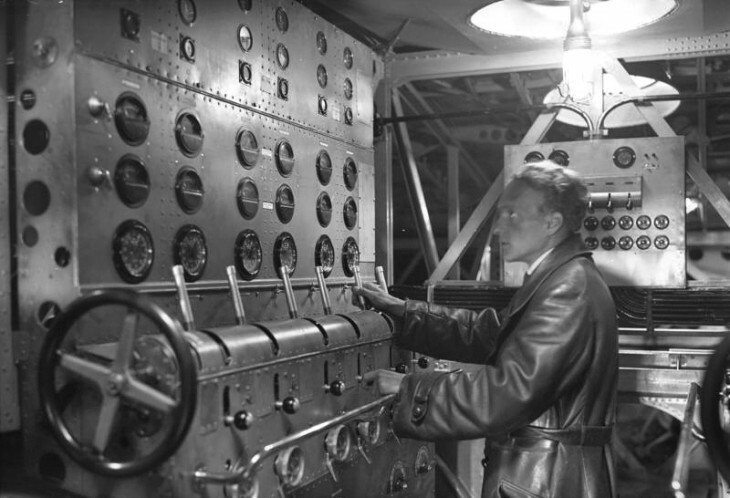 Because of the complicated 12-engine propulsion, totaling 144 cylinders and 7,320 horsepower, the engines and throttle were not controled by the pilot, but instead by a dedicated engineer working in an engine control room located behind the navigators station and cockpit. The pilot would ask the engineer to adjust the throttles to his requirements. The interior of the Dornier Do X was designed to carry up to 70 passengers on long-haul flights, or 100 on shorter journeys. 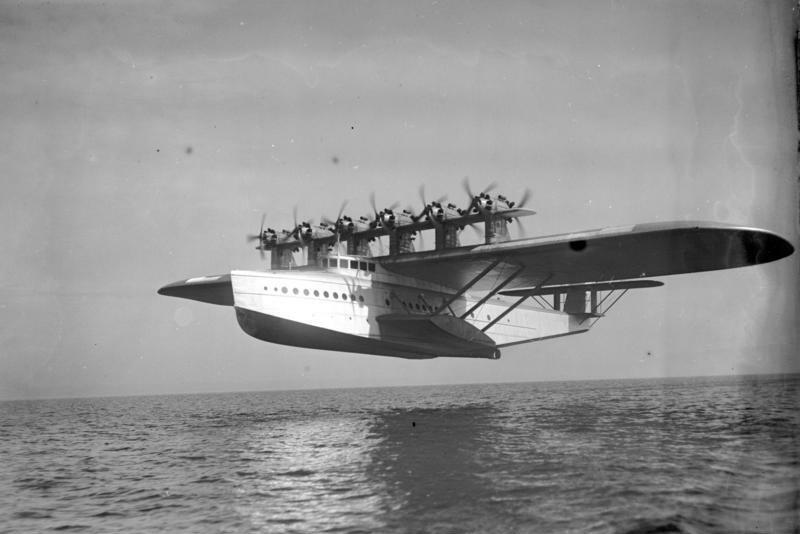 However on one display flight around Lake Constance - and more to prove a point than anything else - the Dornier Do X carried a total of 169 passengers and crew. A record which stood for another 20 years. 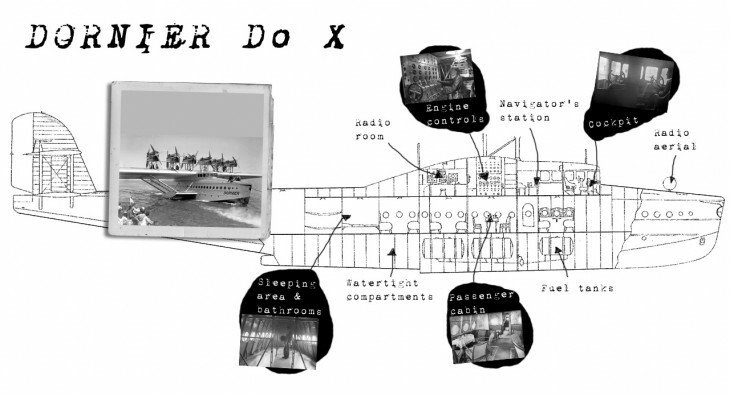 The interior of the Dornier Do X was spread over three decks. 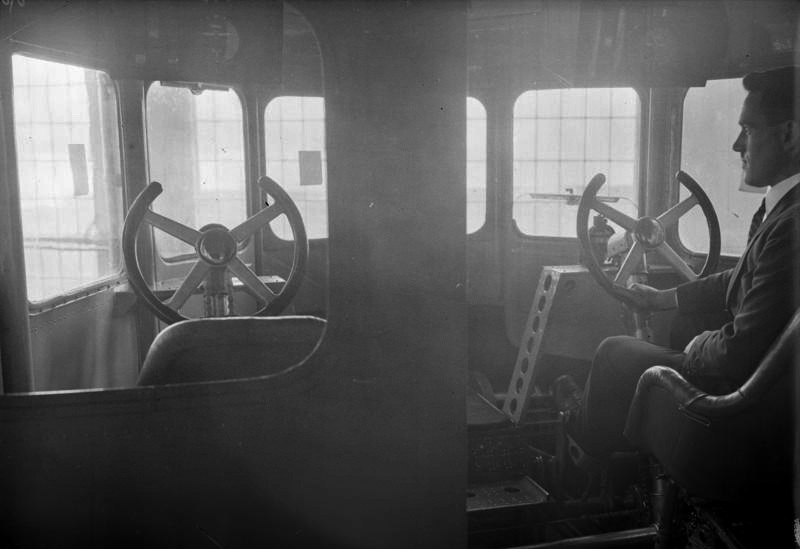 On the top deck there was the cockpit, navigators station, engine control room, and radio room. 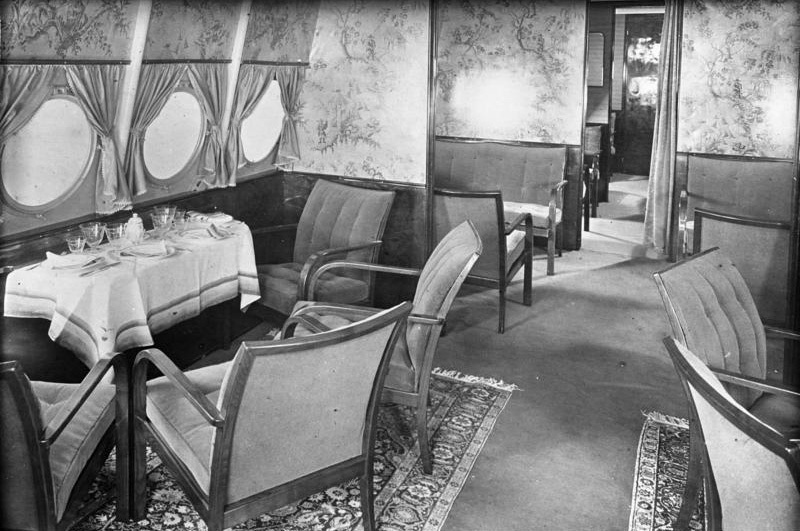 On the main deck below was the passenger compartment. Here you could find luxurious seating areas, a bar, dining rooms, bathrooms and sleeping accomodation for longer journeys. On the lower deck there were three seperate fuel tanks and nine watertight compartments to ensure the aircraft would remain afloat, even if two of them ruptured. On November 1930 the Dornier Do X set off on its most adventurous flight yet. The ultimate destination was the United States, however along the way the aircraft made numerous stops, in the Netherlands, England, France, Spain, and Portugal. Unfortunatley while in Lisbon on the 29th November, a protective tarpaulin caught alight after touching a hot exhaust pipe. The resulting fire destroyed most of the port side wing and meant the aircraft had to remain in Lisbon for six weeks while repairs took place. Once the aircraft was airworthy again it set off down the Western coast of Africa before setting off across the Atlantic headed for Natal in Brazil. From there the aircraft headed north before finally arriving in New York on 27th August 1931. Not exactly a speedy trip, however the aim of the journey wasn't to get from A to B in the fastest possible time. But instead show the aircraft off to as many people, and potential customers, as possible. After spending nine months in the United States, where it went on display at what is now LaGuardia Airport and undergoing a thorough engine overhaul, the Dornier Do X set off home for Germany. 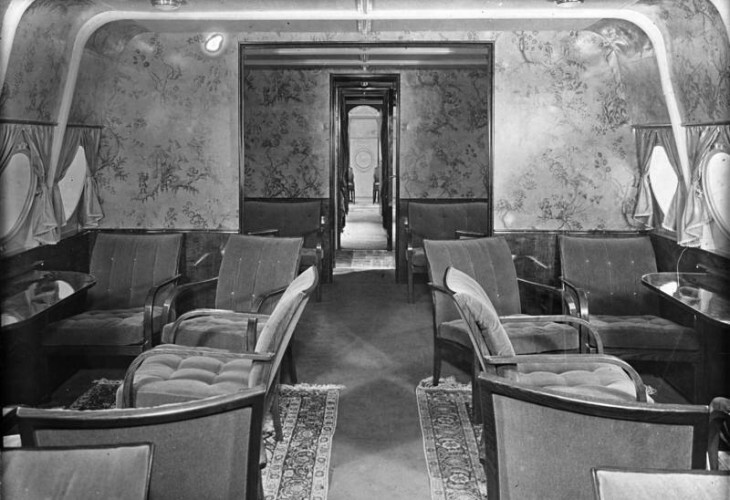 It arrived in Berlin on 24 May 1932 where a crowd of 200,000 turned out to watch its return. Later the aircraft was operated by Germany's national airline until 1933 when a crash-landing broke off the tail section. After a three-year restoration the aircraft finally turned up in the new German aviation museum in Berlin. It remained there until it was destroyed during an RAF raid in 1943. Fragments of the broken tail section still reside in the Dornier Museum in Friedrichshafen. In the end the Dornier Do X turned out to be a remarkable aircraft with one fatal flaw. Nobody wanted it. Well the Italians bought a couple, but it wasn't enough to make the aircraft a commercial success, and in the end only the three aircraft were ever produced.